This weekend seems destined for some decidedly domestic activities. Luckily, the Game Informer editors also have some fun games on their to-do list. When we’re not washing laundry, serving up a delightful plate of amuse-bouches, and wrangling with furniture, we’ll be playing Tetris Effect and Red Dead Redemption II. Are you doing something fun this weekend? Let us know in the comments below! 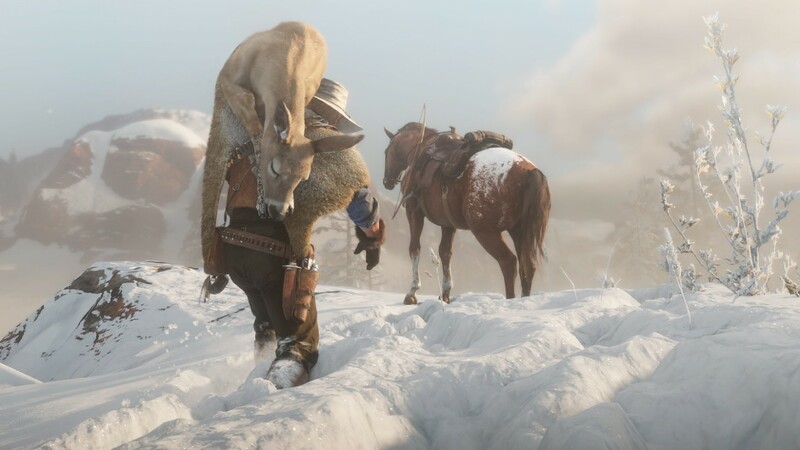 Kyle Hilliard (@KyleMHilliard) – Progress has been slow, but enjoyable in Red Dead Redemption II, so I plan on continuing along that path. I have also really been enjoying Tetris Effect and I am near the end of the story (?) campaign. I am excited to see that to the end. Normally I would see The Grinch this weekend, but I saw it last night. You don’t need to see it. It’s not bad – just bland and forgettable. Also, laundry. So much laundry. Dan Tack (@dantack) – Culatello prosciutto, sopressata, bufala mozzarella, burrata, stone ground course mustard, Carolina Reaper sauce, fresh jalapenos… Couple soft/hard breads to tie it together but SMALL PORTIONS. Essentially a cheese plate and charcuterie all-encompassing package with layers to it, high focus on soft cheeses and a celebration of mozzarella and heat. Wash down with an ice-cold Cheerwine and ditch the standard morning double espresso with a Rainbow Unicorn Bang for a jump start to a productive weekend that’s sure to fire on all cylinders. Jill Grodt (@Finruin) – Last weekend, I stayed up for 25 straight hours to be a part of Extra Life. It was amazing, but maybe I’ll make up for it this weekend and sleep for 25 hours. I’m pretty sure that’s how sleep debt works. As for games, I aim to make a house raft in The Forest where I can’t get eaten in the night; I should start a story mission in Red Dead, but I’ll probably end up exploring the world more; and I also want to jump into all the VR games that have been piling up. Ben Hanson (@yozetty) – It’s the weekend already! Let’s see, what to play… I guess I’ll keep trucking away at Red Dead Redemption II. I’m also committed to buying Tetris Effect on PS4… although I wish it was on PC already. Then there’s always The Quiet Man… just sitting there on Steam… begging to be played… Have a good weekend! Kimberley Wallace (@kstar1785) – I finally finished Spider-Man, which I adored. Now I’m ready to get fully immersed in Red Dead Redemption II. I’m the type of person who loves to just cuddle up with a video game for the weekend, and the first snowfall in Minneapolis is telling me that’s exactly what I need to do. Imran Khan (@imranzomg) – This weekend, I’m going to be assembling some furniture that I’ve been lazy about assembling for the last few weeks. I’m also going to play more Red Dead Redemption II, which feels a lot like assembling furniture, if only because I’m putting a lot of boring work into putting pieces together and hoping what comes out of it was worth the confusing early hours. I will be at Day of the Devs in San Francisco on Sunday, so say hi if you see me!